20120225 + Up in the am and J&I out on the town. 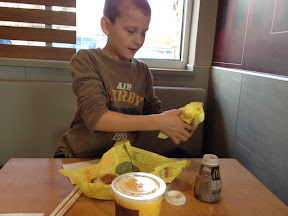 First stop was McD's where we had a hearty healthy bfast ;-) Then J played his iTouch while I got a quick haircut. Across town to MicroCenter to get an 8 port switch for the cameras coming... we walked around the entire store looking at stuff. Then we got what we came for and headed to the Magic Shop where J showed the guys his card trick and then they taught him a couple more tricks. On to the find fire bricks, that were way to expensive... Lunch on the road at Taco Bell and J got a bloody nose :-O Everything ok and in to Home Depot to get supplies for the Farm repairs we have lined up. While there we found a set of gas logs on super sale, so we got them! Home and D and I finished putting the doors on the tool table. Then D&I ran to back to Home Depot to inspect the pipes on a different set of gas logs because the one I got had twisted and crimped hoses :-s back home with a new set of gas logs and I ripped the house apart. I found the old line set and valve hidden in the floor and got it all exposed and open. Making lists of install steps and parts needed... To bed late. 20120224 - Up and at the desk all day, boiling sap in the background. L had to leave and work at the 'Candy-land Ball', a dance for Fathers and Daughters at our church, so I had all 3 of the boys. We went to Long John's for dinner where we ran into a couple of friends. Then we dropped D off at 'Midnight Madness' at his school, a time for the 6th graders to play games, have a talent show and just goof off. JG&I to Meijer to get some stuff, then home. L home and then I ran to get D at midnight. He was all juiced up and stayed up helping me set up the router.